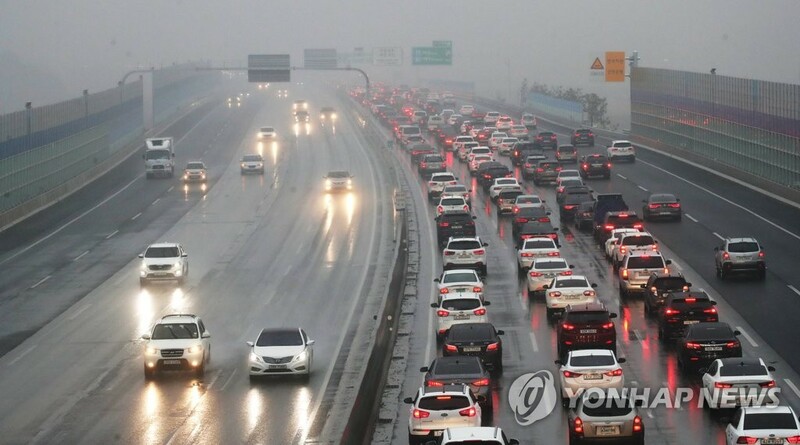 Traffic congestion will likely peak at around noon on Monday as millions of South Koreans head to their hometowns to celebrate the Lunar New Year's holiday, highway officials said. It is estimated to take around six and a half hours from Seoul to the southeastern port city of Busan. It will take around five and a half hours from Seoul to Mokpo and five hours to Gwangju, both major cities in the southwestern region. Some sections of the country's highways remained congested, with cars moving at speeds of slower than 40 kph, highway officials said. Traffic congestion is expected to peak from noon to 1 p.m. before easing later in the afternoon. Highway officials project that around 4 million cars will be on the road throughout Monday. This year's Lunar New Year's Day, one of the largest traditional holidays in South Korea, falls on Tuesday. The weekend extended the three-day holiday from Monday to Wednesday to five days.